God can transform us, the way we parent, and the atmosphere of our home--even one with a defiant teen. 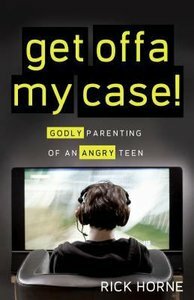 Parents who are satisfied with God's glory first will be able to glorify God in their interaction with an angry teen. Get Offa My Case will help parents learn how to hold their teen accountable with respect and sensitivity. Our prayer is that the parent may be God's tool to bring about change in a teen's heart. This book will help the parent to find the joy of the Lord and re-establish godly family leadership--even if the teen doesn't change. About "Get Offa My Case!" M. Div. (Reformed Episcopal Seminary), M. Ed. (West Chester University), D. Min. (Westminster Theological Seminary) With over 30 years in Christian school guidance and counseling, Rick is the coordinator of the Graduate Concentration in School Guidance Counseling in the M.Ed. Curriculum and Instruction major at Columbia International University. He is Chester, PA Site Coordinator and Academic Dean for The Urban Ministry Institute of World Impact, Inc. Rick and Betty have been married 42 years and have six children and 14 grandchildren.